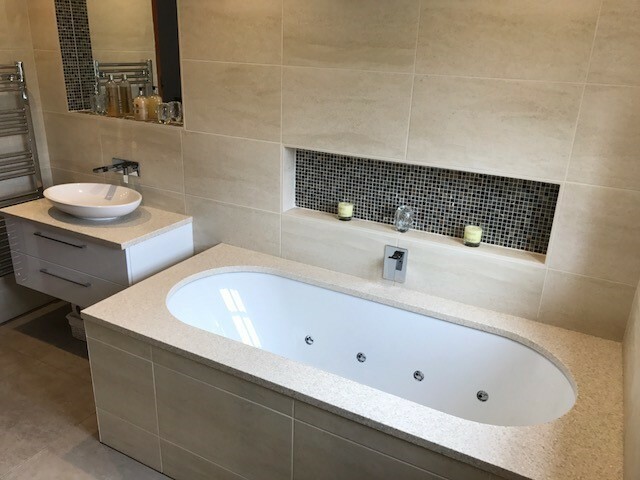 Re-modelling your bathroom should always be an enjoyable process, but with the endless options facing you the one you expect to be most exciting is choosing the tiles. Of course, the excitement of finally choosing your tiles might suddenly become overwhelming with the options available. Should you go light or dark? Big or small? Shiny or matt? Textured or natural? Tiles set the tone for the entire look and feel of the finished space and will likely be the first thing you notice. It's enough to make that enjoyment turn to stress and worry about whether you are making the right choice. Well, fear not! Bubbles Bathrooms in Basingstoke, Hampshire. Are here to share some tips for choosing your tiles, making it easier to narrow down what you really want to make that dream bathroom. The first hurdle that can seem the most daunting is what colour should you choose. Think about the size of the room. It's a good idea to use lighter colours if you have a smaller bathroom, as this will help to give the impression of more space. Lighter tiles like greys or warm neutral colours are on trend now. Here are some examples of some tiles by Porcelanosa. What do you imagine will be the first thing to catch your eye when you walk into your bathroom? Will it be the walk-in shower enclosure, the roll top bath or maybe the large vanity unit? Well why not consider using a feature tile as your main focal point in your bathroom? Whether you decide to add it in your shower area, behind your bath or just as a splash back behind your basin, a feature tile can give your bathroom that extra 'wow'. If you've already chosen the main tile and decided against a feature tile for your space, you may want to do something a little different on the floor in your bathroom. A wood effect floor or even a patterned tile can add a bit of character to any room. The Scandi look is also very much on trend now with rustic wood finishes and soft marble colours. What size suits you best? If you think your bathroom is small doesn't mean you need to use small tiles. Larger tiles can make a room feel bigger and less cluttered. Popular sizes such as 30x60cm on the walls and 60x60cm on the floor can give you feeling of more space in your bathroom, but if you want to be bold why not try a 90x30cm or even a 120x45cm size tile to make a big statement. Is being practical the way to go? Small tiles such as mosaics look great in a small area as a but in a large area you will have a lot of grout, so the maintenance will again be a bit higher. When choosing your tiles, ask yourself how willing you are to be vigilant about keeping your tiles looking their best over the lifetime of your bathroom. Tile layout, shall I match up the grout lines? While there's nothing wrong with a standard tile format, it can very effective to do something a bit different. Brick effect, hexagon and herringbone can create a real statement on your walls or floors.